fae screich o dawn tae dailygaun. dinnae sned tha leevin roots. on sindert squares o tha yin colour. The original poem, ‘Knock the Fences Down’ (1965) is in Azeri and is by the prominent Azerbaijani poet, Bakhtiyar Vahabzade (1925– 2009). I have used the English translation by Talat Sait Halman as a basis for my free translation into Ulster-Scots. Ulster-Scots is the variety of Scots traditionally spoken in parts of Ulster: it is recognised as a minority language and has a fairly substantial wrien tradition. 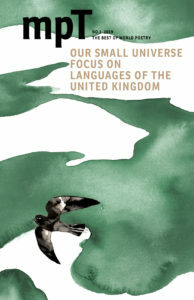 Vahabzade’s poetry is interesting in the context of Northern Ireland as it deals with identity politics and language. This specific poem is timely given the current debates around the idea of borders in Northern Ireland and beyond. Translating into Ulster-Scots adds a linguistic border between most readers and the universal sentiments (arguably slightly naive at times) of the English translation.